Published by Mushroom Publishing in 1998. Currently out of print. An electronic version is under consideration. Copies are available in local libraries, and second hand copies can be found. The Weston Local History Society presents a selection of articles about the people and events that have shaped, or been shaped by, the picturesque village of Weston. Marking the 80th anniversary of the Armistice, Kate Clarke looks at life at Bath War Hospital in Combe Park. With 1300 beds it was one of the largest war hospitals in the country, yet the Imperial War Museum has no record of it. The article recognizes the huge efforts, kindness and friendship given by villagers and staff, and the great difference they made to the lives of the wounded soldiers. Michael Rockey takes us on an exhilarating walk along part of the Cotswold Way, giving us a deeper understanding of the stunning countryside that surrounds Weston, and an insight into the wealth of history on our doorstep. Eliza Day was born in the same year as Queen Victoria, but her life could not have been more different. Experiencing severe poverty — forced even to pull up cabbage stumps for food — her life began to change for the better after she arrived in Weston. Beryl Newns-Wood cracks the code of Domesday Book to show us how Weston may have been over 900 years ago, and explains the complex number- ing system in the High Street, which baffles every new postman sent to try his luck… just where is number 89A? Discover, with Barry Smith, all about Agnes Weston, a one time resident of the village whose personal commitment and courage made an enormous impact on the lives of many people. And who was the famous actor involved in secret negotiations to purchase a desirable property in the village? Michael Rockey provides the answer. 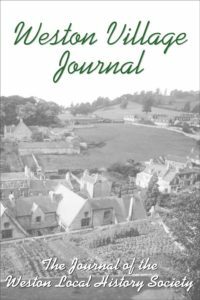 The book is illustrated with many fascinating photographs, including some rarely seen views of the old village, and some never before published.